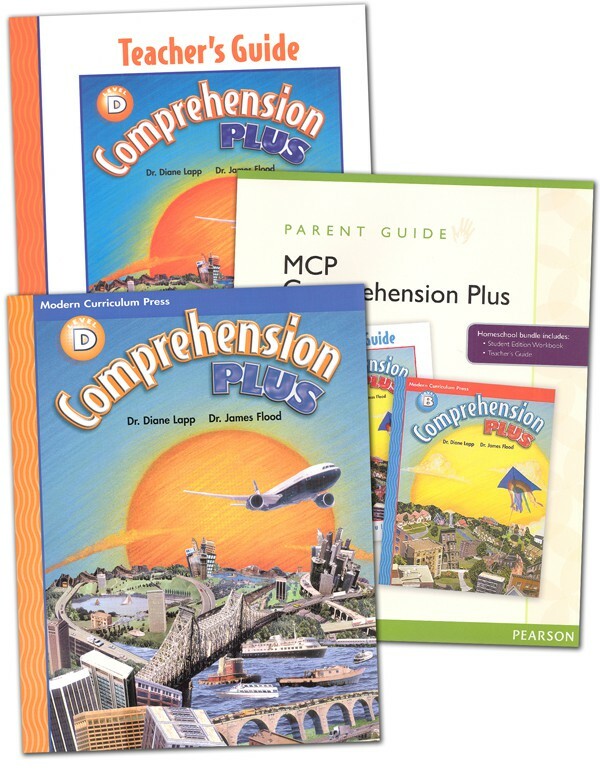 MCP Comprehension Plus Homeschool Bundle. Each bundle includes a Student Edition Workbook, Teacher's Guide, and Parent Guide. MCP Comprehension Plus provides instruction and practice in the major comprehension skills and strategies children need to derive meaning from written text. The Student Edition Workbook and Teacher's Guide for each grade are designed to work in tandem to help your child master and apply these important comprehension skills. *Introduces focus comprehension skills in easy-to-understand form *Motivates children to read with high-interest selections written at a specific grade or reading level *Connects topics and skills to a writing activity and reviews and maintains previously taught skills. *Engages children with interactive exercises *Teacher's Guide features comprehensive, easy-to-follow lesson plans. Student Edition Workbook: Each lesson focuses on mastering a skill in context by providing meaningul reading experiences for your child. Children are first introduced to the focus skill. Then the skill as well as an opportunity to apply to skill. Finally, your child will read an engaging passage and apply the skill through activities. Teacher's Guide: The Teacher's Guide features tools to help your child learn and practice comprehension strategies, study skills, and word study skills. It includes a Scope and Sequence to help you identify when comprehension skills should be presented and taught. Additionally, there is a Skills Index that details the contents in an easy-to-navigate chart so you can quickly reference skill areas for further instruction. This section is followed by assessment tests your administer throughout the course to measure your child's proficiency in the skill taught. These tests may be used as pre-or post-tests, depending on your child's needs and learning style. The Teacher's Guide also includes a Record Keeping Chart and Progress Record Chart to track and measure your child's skills proficiency. Following the test section are all your lesson plans. Each lesson is structured in an easy-to-follow manner to provide you with complete and consistent instruction. Finally, the back section of your Teacher's Guide includes all of the answers to questions in your child's Student Edition Workbook. 2002. Grade 4.